The property is located on a corner of Kensington Park Road and Kensington Park Mews, to the north of Elgin Crescent. 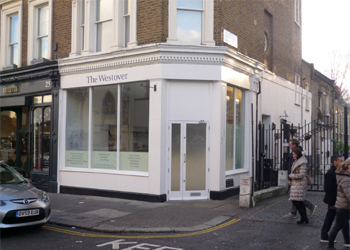 Neighbouring retailers include Provenance Butchers, Oliver Bonas, Couverture and Garbstore, Osteria Basilico, Mufti, Lutyens & Rubenstein and The West Village. Elgin Crescent is home to The Grocer on Elgin, Mr Christian’s, Jeroboams, Neal’s Yard Remedies and Graham and Green. Kensington Park Road’s close proximity to Portobello Road allows the property to benefit from footfall at the weekends associated with the world famous market. View location map. The property benefits from A1 planning use on the ground floor and D1 (medical) on the basement. The space is currently arranged as a reception and sales area on the ground floor, with one treatment room, and three further treatment rooms in the basement, plus kitchen. There is a WC on each level. £65,000 per annum, subject to five yearly upward only review. A new ten year full repairing and insuring lease. The local authority has verbally informed us that the rateable value for the premises is £67,000 and the rates payable for the year ending 31/03/14 are £32,897. Interested parties should make their own enquiries: - Royal Borough of Kensington and Chelsea business rates department 020 8315 2082. An energy assessment has taken place, copy certificate and recommendations available on request: Energy Performance Asset Rating 109 (Band E).